Ah! Where do I start? After an unseasonably warm start to the day, the afternoon and evening turned cold and blustery…perfect weather for sitting around inside eating! As we teetered on our high heels down Clarence Street, we were heartened and warmed by the lovely greeting on our arrival. The main dining room at Becasse is all understated chocolates and beige’s, with a kitchen down one end and a mezzanine above. After settling in at a table in the front part of the restaurant we were offered the special Truffle degustation, an offer that looked amazing, though far more pricey than what we were about to order! 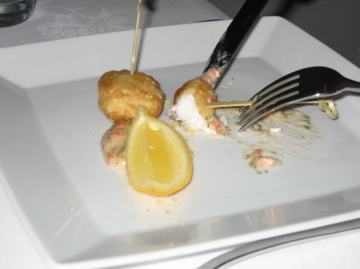 The degustation is an experience. It’s not something you do everyday, and as such it’s pricey, and more so with matching wines. Though, without being a wine expert I’d hazard a guess that the matching wines at $120 per person is actually quite reasonable…? I don’t know, you tell me? 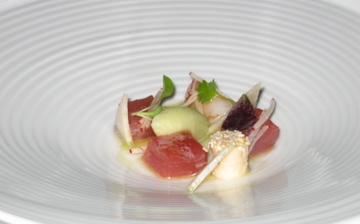 This was followed by the amuse bouche, a fennel and ginger veloute with coriander chantilly. A beautiful warm hit of soup to warm us up after our cold walk…We then settled in for the good stuff…..
Next up was the first seafood course, confit yellow fin tuna and king prawns. 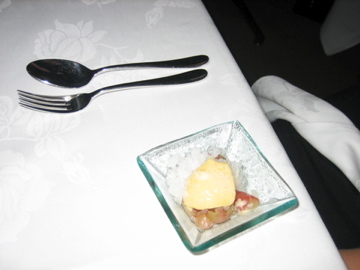 I was super excited about the green apple and lemongrass sorbet served with this, and I wasn’t disappointed. It was very delicate and sweet, though needed more salty to balance things out as the soy and sesame wasn’t enough..
Next course was a beautiful take on the classic fish & chips; beignets of whiting with piperade emulsion and citrus salt. 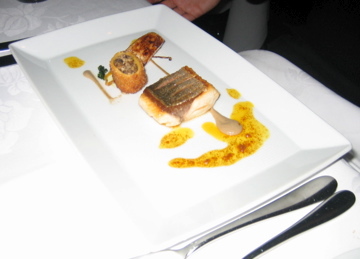 The batter on this fish was the lightest I’ve ever had, with not a trace of oiliness. On to Course 4! We were not even half way through! 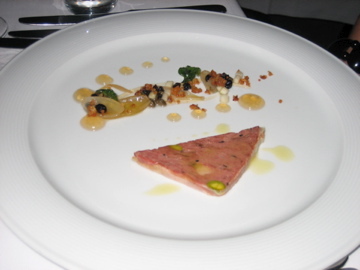 This terrine I’m assuming, was duck foie gras, though I can’t find anything on the web to reference this dish, except the region of France as a provincial style of cooking. 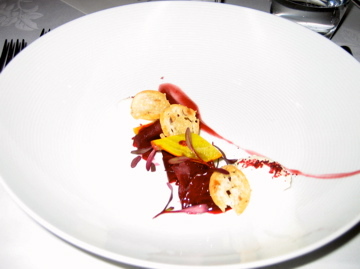 Any help with letting me know what this dish was actually concocted with would be appreciated. 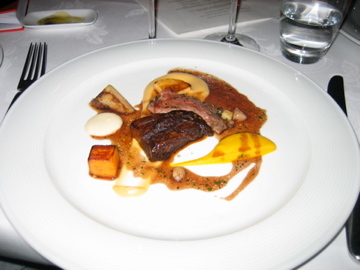 It was gorgeous, and a lovely introduction to the heartier part of the meal.. 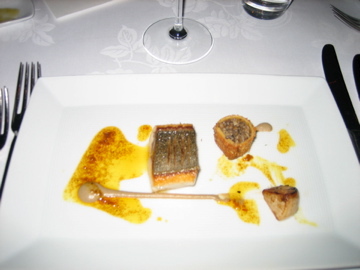 The next dish returned to the predominantly seafood theme; pan-fried hiramasa kingfish, with aubergine puree, cannellone of mushrooms and ras el hanout and turnips. The mushrooms were truly divine, minced up and stuffed into the crispy fried pastry…The ras el hanout flavoured the oil and gave the dish a bit of a lift..
By this stage it was past ten pm and we were as happy as pigs in mud and getting rather pissy! Those that know me, know how little I drink, so this many glasses of wine was having an effect! The restaurant had started to quieten down. Our trips to the bathroom had confirmed our premium position in the restaurant, by discovering that the toilets were located upstairs on the mezzanine level, which seemed much noisier, and had larger group tables. The bathrooms were small and clean, with delicious Molten Brown handwash and handcream. There was no coffee, and we couldn’t even entertain the idea of a cheese course, so we sat and digested, and watched the last of the diners. Our waitress during the evening, was relaxed, warm, and made us feel valued and welcomed, and had none of the starchiness found in waitstaff in other top notch restaurants. She also had gorgeously painted nails and a great smile. All in all, worth every hard earned penny, and an indulgence I hope I get to repeat sometime. nice work Reem, did you have to take notes during dinner or did you swipe a menu? When are you going to review Tetsuya’s?? Great review and description of the courses! I didn’t realise they did a desgustation (I’ve only been there for lunch). 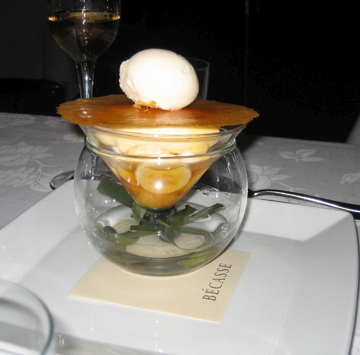 I love the way the dessert is served, it really looks fabulous!